Delphique 2014, the annual National Management Convention of MDI, Gurgaon announces the launch of Entrepreneurship Panel discussion in association with MIDAS. The Entrepreneurship Panel discussion shall be graced by some eminent names in the industry- Mr. Pradeep Gidwani, Founder, Beer Cafe and The Pint Room; Mr.Parag Shah, Chief Mentor, MIDAS; Mr.Prasoon Gupta, Co-Founder, Sattviko and Mr.Vikram Chopra, Co-Founder & CEO, Fabfurnish.com​ shall be speaking at the discussion. Mr.Pradeep Gidwani is a serial entrepreneur with 28 years experience in the beverages industry across Asia. He has been a part of seven start-up operations working on tea, coffee, spirits, wines, champagne, cognac, beer and energy drink categories & now retail – creating and setting up a chain of beer cafes in India. He has had immense experience in the beverages industry working with some of the best corporations -Unilever, UB Group, Diageo, LVMH, Foster’s, Red Bull and Carlsberg. 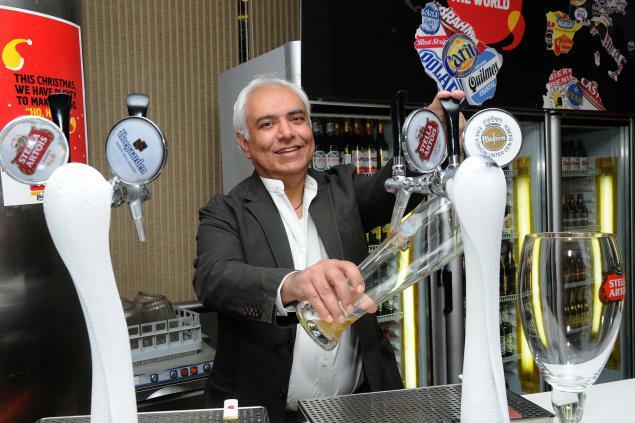 He is the founder of Beer Cafe and The Pint Room, and the former MD, Carlsberg, Redbull and Foster’s. Mr.Gidwani has been involved in developing market entry strategies, setting up businesses including multiple manufacturing units, nationwide distribution networks, launching brands and successfully delivering the business plan in one of the most complex operating environments in the world with very low budgets. Mr. Parag Shah is the Founder Chairman and the Founder Director of Foundation for Liberal and Management Education (FLAME). He is currently the Chief Mentor of MIDAS, an acronym for Management, Innovation, Design, Arts and Social Sciences. He is also the Managing Director of Oxford Golf and Country Club, ranked the best Golf Course in India and 1st in Asia as well. His passion for his work is reflected in the series of successful ventures he has initiated including a chain of Photofinishing Labs, becoming India’s biggest distributor for Nestle in their vending machine operations, launching several Real Estate projects and building and developing over 30 million sqft. of space and venturing in to education by starting FLAME. Mr. Shah has completely changed the way entrepreneurship education is done by combining Strategy, Critical Thought and Innovation in his Entrepreneurship Courses. He is a passionate educationist and a teacher. Mr.Prasoon Gupta is Co-Founder and Director, Sattviko Restaurants. He started his first venture in education called TechBuddy Consulting, where more than 10,000 young students were trained. He is also associated with a non profit social venture for democratic reforms called Meravote.in. He has also held the post of Director, I-Cube Systems in the past. Mr.Vikram Chopra is the Co-Founder and CEO of FabFurnish.com – India’s largest online retailer of furniture and home décor. He holds a master’s degree in business administration from The Wharton School, University of Pennsylvania, and has worked with McKinsey & Company and Sequoia. Given his varied work experience and strong business acumen, he has played a dynamic role in taking the Fabfurnish brand to a whole new level. Having such eminent personalities as speakers for the Entrepreneurship Panel, will encourage the participants to ignite the spirit of entrepreneurship within them.The participants are bound to learn and get inspired by their varied experiences.